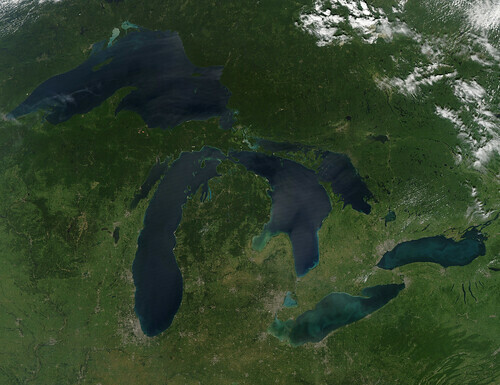 Late August 2010 provided a rare satellite view of a cloudless summer day over the entire Great Lakes region. North Americans trying to sneak in a Labor Day weekend getaway on the lakes were hoping for more of the same. The Great Lakes comprise the largest collective body of fresh water on the planet, containing roughly 18 percent of Earth's supply. Only the polar ice caps contain more fresh water. The region around the Great Lakes basin is home to more than 10 percent of the population of the United States and 25 percent of the population of Canada. Many of those people have tried to escape record heat this summer by visiting the lakes. What they found, according to The Hamilton Spectator, was record-breaking water temperatures fueled by record-breaking air temperatures in the spring and summer. By mid-August, the waters of Lake Superior were 6 to 8°C (11 to 14°F) above normal. Lake Michigan set records at about 4°C (7°F) above normal. The other three Great Lakes – Huron, Erie, and Ontario -- were above normal temperatures, though no records were set. The image was gathered by the Moderate Resolution Imaging Spectroradiometer (MODIS) on NASA’s Aqua satellite at 1:30 p.m. Central Daylight Time (18:30 UTC) on August 28. Open water appears blue or nearly black. The pale blue and green swirls near the coasts are likely caused by algae or phytoplankton blooms, or by calcium carbonate (chalk) from the lake floor. The sweltering summer temperatures have produced an unprecedented bloom of toxic blue-green algae in western Lake Erie, according to the Cleveland Plain Dealer. NASA image by Jeff Schmaltz, MODIS Rapid Response Team, Goddard Space Flight Center. Caption by Mike Carlowicz.